Zydol SR (Tramadol) 100mg 60 tabl. Zydol is used as a painkiller for severe pain. The active ingredient in Zydol is tramadol. Zydol is an opioid analgesic, a morphine-like medicine. It is stronger than paracetamol and helps to relieve severe pain. Zydol (Tramadol) is only available on prescription. Zydol is used to relieve severe pain, such as headache or muscle pain. It can also be used for other types of annoying pain. When you are injured or ill, neurotransmitters send a signal to the brain that there is pain. The brain responds to these signals and, in doing so, protects the body. However, these signals have no useful function in the case of illness or an operation. Zydol blocks the transmission of pain signals sent by the nerves to the brain, therefore less pain is actually felt. Zydol tablets and drops reduce pain within an hour. Suppositories take about two to three hours to become effective and last for six to eight hours. Modified-release tablets and capsules have a pain-relieving effect of around 12 to 24 hours. Zydol SR tablets are slow-release tablets. They are designed to release the tramadol slowly and continuously in the blood throughout the day. This provides prolonged pain relief, so Zydol SR tablets are only taken twice a day. 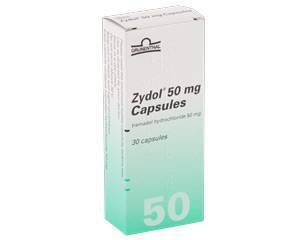 Zydol can be ordered online in capsule form (50 mg) or tablet form (100 mg, 150 mg, 200 mg, 300 mg and 400 mg). The maximum dose of Zydol (Tramadol) is 400 mg daily. Orders for more than 400 mg, with a maximum of 30 days, will be rejected by doctors and pharmacies.